Aishwarya Rai Miss World| Aishwarya Rai Was born 1 November 1973 in Mangalore, Karnataka, India. She is Indian Actress, Model, and the Miss World 1994 Pageant. Through Rai Start, he Successful Acting Career, and She was Honoured with the Padma Shri By the Government of India. 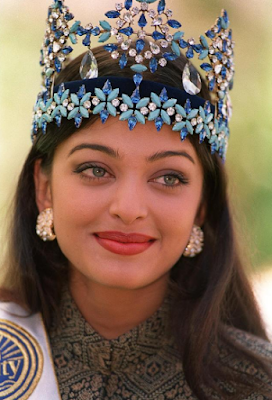 Today We are talking about Aishwarya Rai Miss World 1994 Pageant. Aishwarya Rai Miss World 1994 Pageant. The Forty Forth edition of the Miss World held on 19 November 1994. The Pageant attracted eighty-seven Contestants from around the world. At the Night 21 years old Aishwarya Rai has Crowned the new Miss World. Aishwarya Rai Miss World 2014| Aishwarya Rai Bachchan Was Invited to be a part of Miss world 2014, and She comes with her Husband Abhishek Bachchan and Daughter. and She Accepts a Lifetime " Beauty With a Purpose" Award for the tremendous amount of work she has done for charitable causes in her lifetime. watch it Hear.